BP has announced a $7.2 billion deal with Indian billionaire Mukesh Ambani’s Reliance Industries Ltd. explore deepwater fields in India. BP will get a 30% stake in 23 oil and gas blocks.The agreement allows for $1.8 billion in future payments based on exploration success that would lead to the development of commercial discoveries. All payments and combined investment could put the total at $20 billion. The alliance marks a 50-50 joint venture between the companies for sourcing and marketing natural gas in India. Reliance shares traded up 2.98% on the news. This is the second such deal for BP this year. In January, the company offered Russian oil giant Rosneft $7.8 billion worth of BP shares to explore and develop three blocks on the Russian Arctic continental shelf. BP has been diversifying its portfolio since its U.S. deepwater operations were shutdown after the Gulf spill. 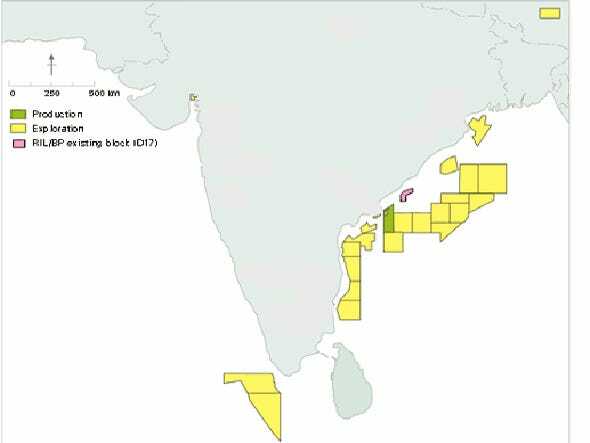 BP first partnered with Reliance in December 2008 on the D-17 deepwater block on the east coast of India. It has a 50% interest and operates the block while Reliance holds the rest of the stake. BP employs 8000 workers in India through its ventures with Reliance, Castrol and the Tata Group.